What’s good: When I wanted to replace the silencer on my BMW R100R I discovered there is a very limited range of aftermarket products available. But SuperTrapp produce a range of universal silencers to suit most bikes. The only fiddle was getting a piece of link pipe made up to go between the existing system and the SuperTrapp. 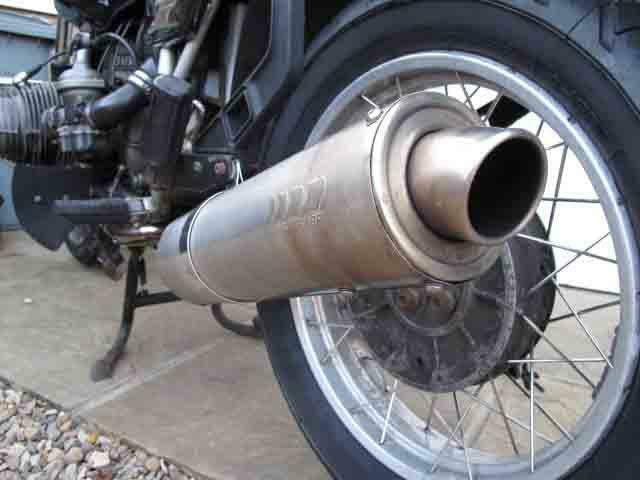 The beauty of this motorcycle exhaust is it is so much lighter than the original item and the best bit is the sound, it has turned a very mundane sounding BMW into a bit of a snarler without being offensive. It features the legendary SuperTrapp 4-inch disc system which can be tuned both for back pressure and sound (the more discs you use the louder it is, and with fewer discs you can increase low-end torque and reduce sound). What’s not: Where the hot exhaust gases come out of the diffuser, they heat up the inside the main body of the pipe, this in turn has discoloured the stainless steel. Annoying, as it looked so good when it was new.